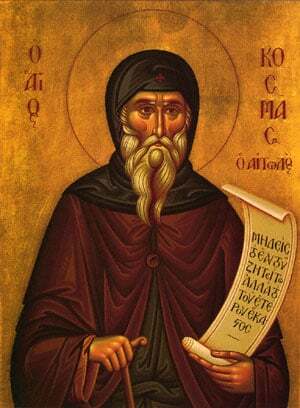 Our holy Father Cosmas was from the town of Mega Dendron (Great Tree) of Aetolia. At the age of twenty, he went to study at the school of the Monastery of Vatopedi on the Holy Mountain. Later, he came to the Athonite Monastery of Philotheou where he was tonsured. With the blessing of his abbot, he departed for Constantinople where he learned the art of rhetoric, and thereafter, he began to preach throughout all the regions of northern Greece, the Ionian Islands, but especially in Albania, for the Christian people there were in great ignorance because of the oppression and cruelty of the Moslems. Finally, in 1776, after having greatly strengthened and enlightened the faithful, working many signs and wonders all the while, he was falsely accused by the leaders of the Jewish people and was executed by strangulation by the Moslem Turks in Albania. Share the feast of Cosmas of Aetolia, Equal to the Apostles with an icon greeting ecard.